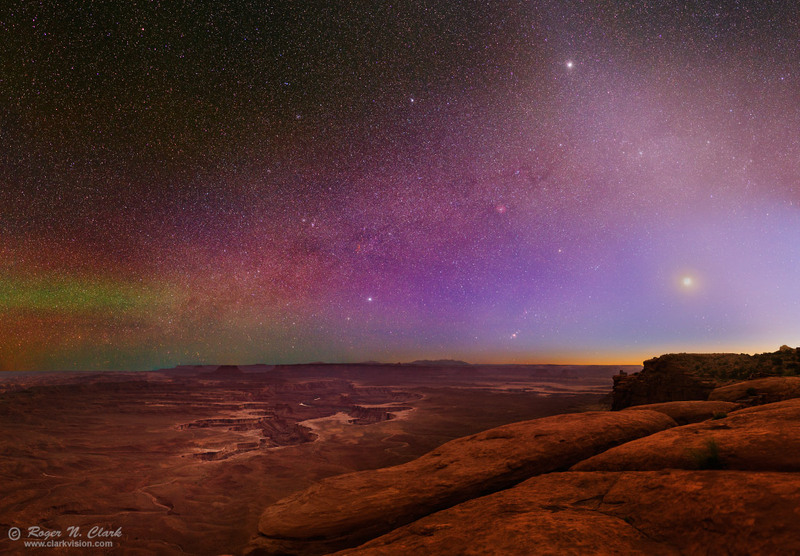 On an early May evening, the Milky Way and the constellation of Orion sets in Canyonlands National Park, Utah, making a stunning nightscape with a rainbow of colors. The bright object on the right is the crescent Moon, and above to the left, near the top of the frame is the planet Jupiter. A bright bluish-gray band from the Moon to Jupiter is the Zodiacal light. The winter Milky Way runs from the lower left to between Jupiter and the Moon and shows several red emission nebulae and many star clusters. 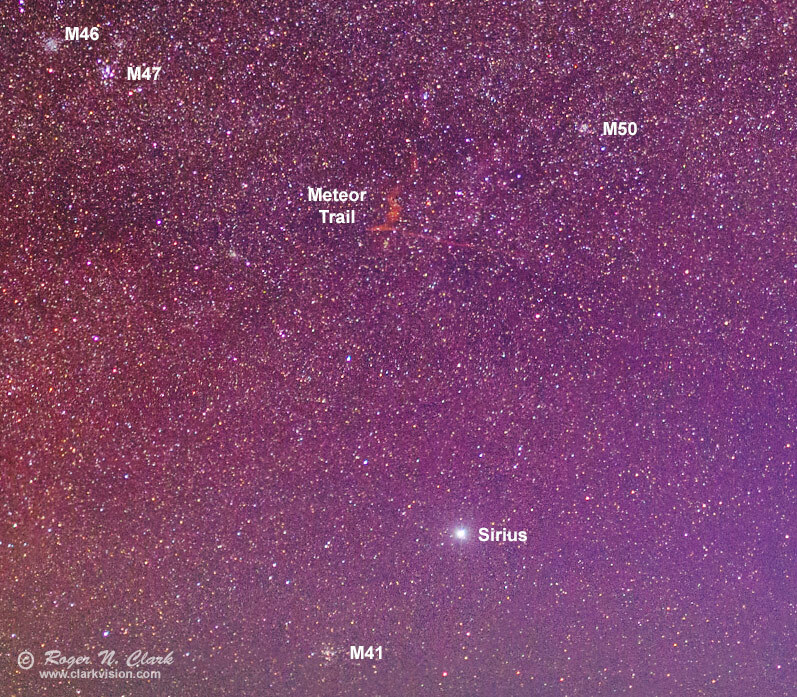 The red and green bands near the left edge in the sky is banded airglow. The airglow adds to the blue twilight near the center of the image, turning to blue toward the right side of the image, with yellow lights scattered around the Moon. All this light imparts a reddish color to the landscape. This scene is all natural light. The light on the land is that from the night sky: light from stars, blue twilight, the Zodiacal light, the Milky Way galaxy, and airglow: light from molecules in Earth's upper atmosphere excited by solar ultraviolet light during the day and from cosmic rays. The molecules emit light throughout the night. The red is typically from hydroxyl (OH) 80 to 90 km high, and the green is from oxygen around 95 km high. The imaging was started at 1 hour and 10 minutes after sunset, so the twilight was very faint, yet the long exposure brought it out nicely. The Moon was only 2 days old, so a thin crescent and without too much impact on the sky except within a few degrees of the Moon. For more on natural color in the night sky see Parts 2a, 2b, 2c and 2d on Color of the Night Sky and proper post processing to show those colors. The bright star near the center of the frame, a little above the horizon is the star Sirius, Alpha Canis Majoris is the brightest star in the night sky. Above Sirius and slightly to the left, abut the same distance as Sirius is from the horizon, is a red nebula. That is the trail of a very bright meteor! Figure 1 shows an enlargement of the area. I recorded the trail on 5 frames over about a 3 minute interval and the frame included here fortunately showed the trail the best. The other frames had the trail near the edge of the frame, but show the evolution of the trail with time: a twisted corkscrew shape. Apparently the meteor occurred when I was imaging to the left where the green airglow was. Figure 1. A 1/2 resolution image showing the meteor trail discussed above. At this scale, the full image would be about 69 inches across. Technical. Canon 6D 20-megapixel digital camera, Sigma 35 mm f/1.4 DG HSM lens at f/1.4. Forty two exposures at ISO 1600 were made for the mosaic. On the sky, the camera tracked the stars using an Astrotrac, with 29 exposures, 30 seconds each, ISO 1600 then 3 images of the crescent Moon were made for an HDR of the lunar disk, and finally 10 images with 120 second exposures of the land were made with no tracking. The land includes multiple focus points to allow focus stacking for improved depth of field, making a sharp foreground as well as sharp sky. Final image is 9,909 pixels wide by 9,976 pixels tall covering about 103 x 104 degrees. Higher resolution versions show detail on the lunar disk. This image is a crop of the stars off the top to give about a 1.5:1 aspect ratio. Link to more information on Nightscape Photography with Digital Cameras. Link to more information on The Color of the Night Sky.